On Sunday, December 2nd at MetLife Stadium, the New York Giants (4-8) managed to hold on for a 30-27 overtime victory over the Chicago Bears (8-4). Winning on a batted fourth-down pass by cornerback Janoris Jenkins, New York managed to clench this victory amidst recent games they have managed to throw away within the last twenty seconds of play. Such games include a 25-22 loss to the Eagles and 23-20 loss to the Falcons. 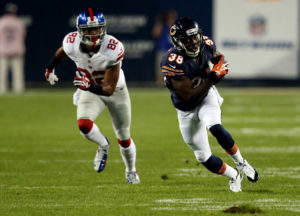 Led by rookie running back Saquon Barkley, wide receiver Odell Beckham Jr., and quarterback Eli manning, the New York Giants matched a strong effort from the Chicago Bears, led by defensive end Khalil Mack, safety Eddie Jackson, and wide receiver Allen Robinson. With just 1:13 of regulation play left, the Giants classically managed to blow a 10-point lead. Chicago forced overtime by getting a 21-yard field goal by Cody Parkey and a one-yard touchdown pass from halfback Tarik Cohen to Anthony Miller, as time expired in the fourth quarter. The trick-play touchdown was set up be a recovered onside kick by Daniel Brown on a play Giants receiver OBJ did not dive for the ball. This was followed by a questionable pass interference call in the end zone against cornerback B.W. Webb with three seconds left in the game. In the first minutes of overtime, however, New York’s Janoris Jenkins knocked away a deep fourth-down pass to Taylor Gabriel after Chicago quarterback Chase Daniel fumbled on consecutive plays to set up a fourth-and-eight. The Giants were then able to successfully snap the Bear’s five-game winning streak with a 44-yard field goal from Aldrick Rosas in overtime. Rosas, who made just 18 of 25 field goals last season and also missed three extra points, has bound back this season. His 57-yard kick at the end of the first half the Giants some momentum heading into intermission, and for him this season, marked the 24th made field goal in 25 attempts. Ultimately, the Giants owe their win last Sunday to two three things: first, Pat Shurmur’s smart use of his timeouts on the Bears drive that went backwards. Second, Saquon Barkley’s 22-yard run on third and forever on the drive. And third, Manning’s ability to convert a fourth and short on a previous play to a wide open Rhett Ellison along the sideline. The NY Giants face off against the Tennessee Titans in a 1:00 PM home game next Sunday, December 16th.